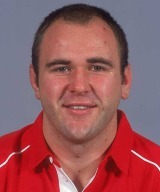 Son of legendary Wales flanker Derek, Quinnell made a name for himself as a gutsy, world class No.8 at a time when the game in Wales was struggling. His Test debut came against Canada in 1993 but it was against France in 1994, as Wales were on their way to the Five Nations title, that he announced himself with a stunning solo try. A move to rugby league with Wigan followed but after two successful seasons, and a run to the semi-finals of the 1995 Rugby League World Cup, he returned to union with Richmond in 1996. He won selection for the 1997 Lions tour to South Africa but a hernia operation prevented him from playing in the Tests, a feat he would later achieve in 2001 - scoring a try against Australia in the first Test victory. He retired in 2005 to concentrate on coaching Llanelli, eventually becoming a popular television pundit.